GONZALES, Texas — In a dusty lot off the main highway in this South Texas town, Vern Sartin pointed to a collection of hose hookups and large storage tanks used for collecting wastewater from hydraulic fracturing jobs. Sartin is a watchman at a disposal well operated by Gulf Coast Acquisitions, where each day oil and gas companies dispose of wastewater by pumping it deep underground. Wastewater disposal wells like this one are becoming a common landmark in the drilling regions of Texas as the water-intensive practice of hydraulic fracturing, or fracking, continues to spread. In the fracking process, several million gallons of water, combined with sand and chemicals, are sent down a well to break up rock and retrieve oil and gas. Some of the fluid comes back up, along with additional underground water. Most of this wastewater is trucked to disposal wells and injected thousands of feet underground for permanent storage. But those wells have caused concern about truck traffic, accidents and the possibility for spills and groundwater contamination. Texas oil and gas regulators may soon tighten the rules for the construction of the wells, and they are encouraging drilling companies to reduce waste by recycling more water. Here and at other sites with big disposal wells, dozens of trucks a day roll in to pump out wastewater. Typically a dark, relatively thick liquid smelling of sulfur, and containing chemicals and minerals, the wastewater generally has high salinity. Sometimes, it contains low levels of radiation. The wastewater goes into a pit, then into a separator tank that allows the remaining oil to surface. Workers then skim the oil and sell it. 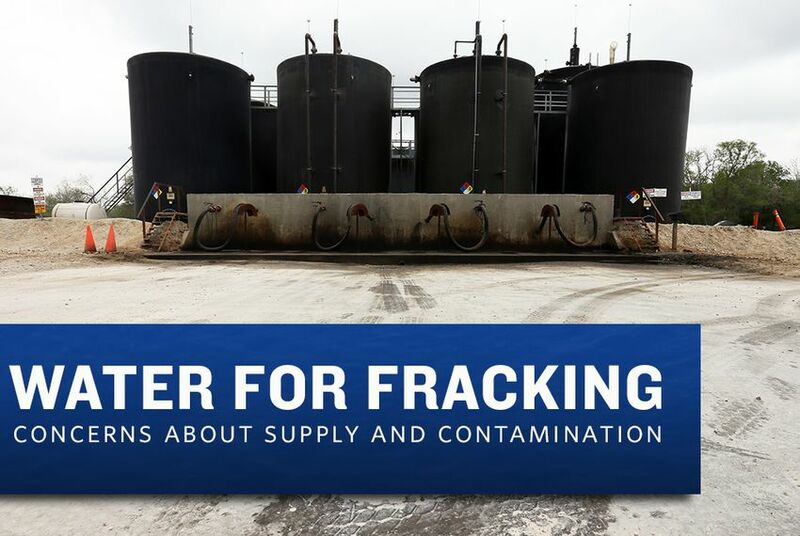 The amount of wastewater being disposed of in Texas wells has skyrocketed with the spread of fracking, to nearly 3.5 billion barrels in 2011 from 46 million barrels in 2005, according to data from the Railroad Commission of Texas, the state’s oil and gas regulator. On average, companies in Texas dispose of 290 million barrels of wastewater — equivalent to about 18,500 Olympic-size swimming pools — each month. The state has more than 8,000 active disposal wells, about 850 of which are large commercial operations, according to the Railroad Commission. That is far more than other drilling states like Pennsylvania or Ohio. Texas has another 25,000 wells that accept waste fluids and use them to retrieve additional oil and gas. It can take months for a company to obtain a permit for a disposal well, because they are controversial. This week, for example, the three railroad commissioners delayed a decision on whether to grant a permit for a disposal well in Palo Pinto County, about 70 miles west of Fort Worth. The commissioners asked about the well’s proximity to tributaries of the Brazos River, the longest river in Texas and a major source of water. The commission’s own records show that last year it approved 72 percent of applications for disposal well permits. A review of complaints to the commission showed several reports of trees and vegetation being killed by wastewater spills from leaky pumps, storage pits and storage tanks. In parts of the Barnett Shale drilling area, in North Texas, scientists have linked disposal wells to earthquakes. In one instance, a Texas disposal well contaminated an aquifer, according to Christi Craddick, a recently elected railroad commissioner. Craddick said wastewater from the well escaped into groundwater nearby. The leak was found in 2005 and affected an aquifer called the Pecos River Cenozoic Alluvium, according to the Railroad Commission. “Occasionally it happens, but not very often, thankfully, given the number of wells we drill all over the state,” Craddick said. The company behind the well had its permit revoked by the commission and has gone into bankruptcy, she said. Another concern is that wastewater injected into the ground might shoot into a nearby abandoned oil well. Texas has thousands of abandoned wells left from the wildcatting days of the last century, and the Railroad Commission is trying to plug them. “We’ve been drilled up like crazy out here,” said Slate Williams, the general manager of the Crockett County Groundwater Conservation District in the Permian Basin. Disposal well operators are generally required to leave at least 250 feet of impermeable rock or clay between “usable quality water” and the area where the wastewater will be injected. When applying for a permit, they must also promise to survey (and plug, if necessary) all wells within a quarter mile. But some older oil wells may not be in state databases, according to Ronald Green, a scientist with the Southwest Research Institute, a nonprofit organization based in San Antonio that has done research on fracking and groundwater. Railroad Commission records show at least five violations against disposal wells last year for the improper plugging of old wells. Regulators are in the early stages of tightening requirements for disposal wells. A Railroad Commission memo last May cited the “issue of insufficient surface casing,” meaning cemented piping, in the disposal wells as they bore through aquifers on their way to deeper geologic formations. The overhauled rules would probably include stricter requirements for the casing of wells and more detailed surveying and plugging of nearby wells (both active and abandoned) to protect water supplies and prevent wastewater from escaping. The rules could also require that groundwater district managers be notified of a new disposal well permit application. Smitherman said he hoped the proposals would be ready around May so that updated rules could be adopted during the summer. Recycling more water from fracking operations could slow the growth of disposal wells. The Railroad Commission approved new rules this week aimed at making it easier to recycle. However, recycling technology is expensive compared with dumping wastewater at one of Texas’ many disposal wells, and its use remains minimal.